(Hans Calmann Gallery, London); a New York gallery, late 1930s; Philip Hofer [1898-1984], Boston; Charles B. Hoyt, Boston; Roland Burden-Muller, Switzerland; Philip Hofer [1898-1984], Boston. The Glory of Venice, National Gallery of Art, Washington, 1994-95, 483, no. 271. Building a Collection, National Gallery of Art, Washington, 1997-1998, no. 57. "Art in Rome in the Eighteenth Century", Philadelphia Museum of Art; The Museum of Fine Arts, Houston, 2000, no. 387. The Poetry of Light - La poesia della luce: Venetian Drawings from the National Gallery of Art, Museo Correr, Venice, Venice, 2014 - 2015, no. 89. Robison, A., MD 15:4 1977, p.387-401, fig.1 & 2. Robison, Andrew. Piranesi Early Architectural Fantasies: A Catalogue Raisonne of the Etchings. (Washington: 1986): 29-30, 120, no. 32. Art in Rome in the Eighteenth Century. Exh. cat., Philadelphia Museum of Art, 2000: 543-544. Nevola, Francesco. 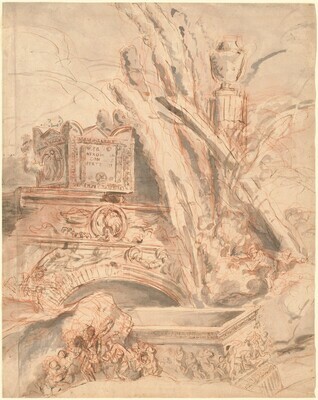 Giovanni Battista Piranesi: The Groteschi. (Roma: 2009): 175, 177, no. 148.